This is one of my favorite summer paleo dinners! 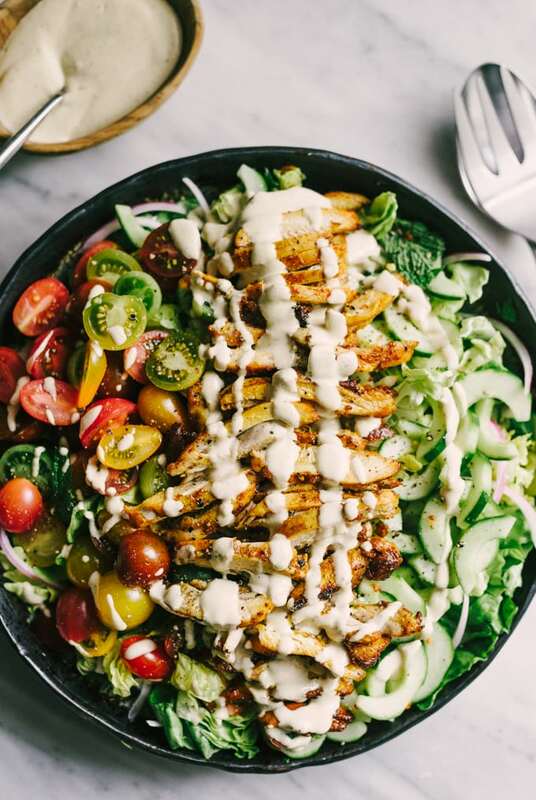 Chicken shawarma salad is an incredibly flavorful, fresh, and elegant weeknight dinner. The greens are tossed with mint and parsley, then topped with crunchy cucumbers, garden-fresh tomatoes, and tender slivers of red onion. Each bite is crisp, bright and bursting with flavor. I like to make homemade shawarma from time to time because duh. It’s a showstopper of a meal for company, and even my pickiest friends and family devour every bite. I typically serve it with homemade pita, cucumber and tomato salad, super smooth hummus, and maybe some yogurt dip. Lots of tahini dressing on the side for slathering and dipping. Leftovers keep reasonably well and make for a quick and easy lunch wrap the next day. Chicken shawarma salad is an incredibly flavorful, fresh, and elegant weeknight paleo dinner. Each bite is crisp, bright and bursting with flavor. The marinade takes just minutes and can be prepped the night before, making for an easy and fast dinner. In a small bowl, add the lemon juice, avocado oil, salt, pepper, and spices and whisk. Place the raw chicken thighs into a gallon-sized zipper bag and pour the marinade over the chicken. Rub the marinade into the chicken with your (clean) hands, then press the air out of the bag, seal, and place in the fridge. Marinate at least a few hours, and up to overnight. I prepare the marinade first thing in the morning for an evening meal. When you're ready to cook, preheat the oven to 425. Remove the chicken from the marinade and place it onto a rimmed baking sheet. Pour any excess marinade over the chicken. Roast for 30 minutes, until the chicken is cooked throughout. Set aside to cool slightly, then slice into 1/2" strips. While the chicken is roasting, prep the salad. Chop the lettuce and herbs, then toss to combine. Chop the tomatoes and cucumber, and slice the red onion. Place the tahini, olive oil, lemon juice, salt and pepper into a blender along with 1/4 cup of water to start. (I love using my Ninja blender to make dressings. The individual cups are the perfect size for small batch items like salad dressing!). Blend until emulsified. Add additional water to reach desired consistency. For salad dressing, vs. a dipping sauce, I use closer to half a cup, sometimes a bit more. Layer the tomatoes, cucumbers, and red onions over the herb salad base. Top with the chicken, and then dress with tahini to taste. Serve immediately.